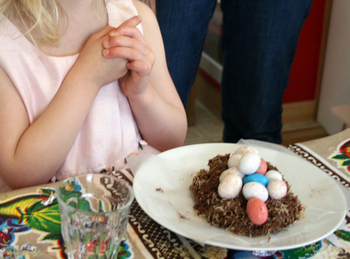 angry chicken: are there chocolate birds for these nests? 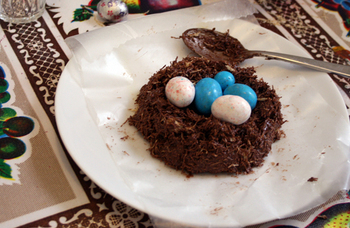 are there chocolate birds for these nests? More spring activities over here. I remember making these in kindergarten, and haven't had them since. Why?? I love them so. It's just shredded wheat, crushed, with melted milk chocolate chips poured over. They are so stinkin' good! Little malt ball eggs are added as a garnish. This is Sam's, quite nice, huh? Delia has a few more eggs on hers. This is a wonderful small person project. Easy, fun, not too messy, and fast. Pour the melted chocolate over the shredded wheat and mix well. Have the kids do this in a big bowl with a spoon so little hands don't get burnt. A big bowl is especially good for enthusiastic stirrers. Dump onto waxed paper and build 3 little mounds. Then using the back of a spoon, make an indent. Fill with eggs and let set. It takes about 1 1/2 hours to firm up. You can just pick them up and eat them when they dry, although the middle child prefers stabbing at hers violently with a fork, shredding it and making a huge mess everywhere, then picking up minuscule pieces and licking them off her fingers. Whatever keeps her busy.